The bike share pilot program is scheduled to begin next summer in downtown Los Angeles. 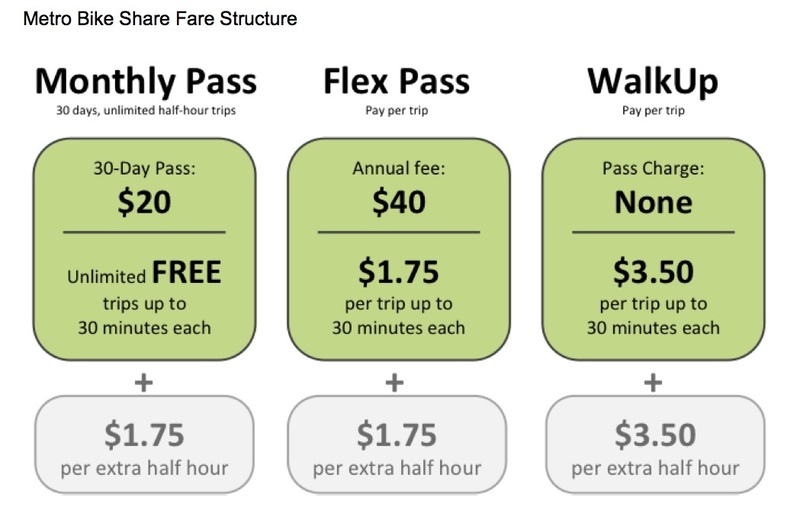 Metro’s bike share fare structure consists of three simple pass options to meet the needs of every potential bike share user, from local residents to tourists — as seen in the chart above. In order to give more people a chance to try the system, Metro is reducing the cost of walk-up trips to $1.75 for the first two months of the bike share program. The Los Angeles County Metropolitan Transportation Authority (Metro) Board today approved the fare structure for the county’s planned Bike Share Program, providing a user-friendly, flexible and accessible system for future regional bike share users. A sample bike share kiosk. Metro’s bike share pilot program is scheduled to begin in mid-2016 with approximately 1,000 bikes and up to 80 bike share stations throughout Downtown L.A. The program will later expand to nine other communities within the county, creating a regionwide system totaling 4,000 bicycles pending board approval. Frequent Users: $20 monthly pass, with unlimited free trips up to 30 minutes each. For trips over 30 minutes on the same bike, $1.75 will be charged for each additional 30 minutes. If users dock a bike within the 30 minute timeframe and check out a new bike, the clock will be restarted and no additional charges will be applied. Occasional Users: $40 annual Flex Pass, plus $1.75 per trip up to 30 minutes each and $1.75 per extra half-hour. Casual Users: No monthly or yearly pass charge is required. A “Walk-up” rate of $3.50 will be charged per trip up to 30 minutes each, and $3.50 per every extra half hour. To provide an incentive for all types of users to try Metros’ Bike Share Program, Metro is exploring a number of promotional activities in connection with the system launch. One such activity will be aimed an encouraging casual users to try bike share in which all walk-up trips will be half off ($1.75) for the first two months of walk-up access. The walk-up rate will revert to $3.50 after the promotion period expires. In developing its countywide bike sharing fee structure, Metro sought to make the system accessible for the greatest number of users as well as a fare structure that would be successful in communities throughout L.A. County. The low price for the walk-up rate at $3.50 is expected to help lower the barrier of entry to draw more people, particularly those with lower incomes, into trying bike sharing for the first time. Metro modeled its fare structure after a transit fare structure to position bike sharing as a integrated element of transit over time. The Board also approved Metro’s multi-step interoperability strategy that phases in efforts to create a seamless user experience among Metro’s bike share program, transit and other bicycle services in L.A. County. With two different bike share vendors in the county, Metro envisions co-locating stations in key areas where bike sharing systems overlap. Metro plans to provide a uniquely branded Transit Access Pass (TAP) card that will serve as the bike share user’s key needed to unlock bicycles at each station. For the launch, fares will be paid by the credit card linked to a bike share user’s account. The user may load transit fare on to the same TAP card at a ticket vending machine. However, Metro envisions a system where the payment mechanism in the bike share system and TAP could be linked. The interoperability strategy, as approved by the Metro Board, will ensure future seamless user integration where the account registration and/or payment for Metro transit services and multiple bike share vendors is linked. How come you don’t use a scaled fare structure depending on how far you travel for buses and trains like they do in Tokyo and other cities? Why does it cost the same to travel one Red Line stop as it does to travel 10 Red Line stops? Metro somehow thinks people living farther away and can afford a McMansion in the suburbs and a car (i.e. SFV, and sometimes, not even residents of LA County but neighboring counties like OC or Ventura), earning $50,000+ or more with a cushy white collar job in DTLA needs to be subsidized with benefits such as free parking and have them only pay $1.75 to travel longer 10-20 or more mile commutes, at the expense of the subsidizes provided by those who live in the inner city, likely an apartment renter who pays higher and ever unaffordable rent prices, doesn’t own a car and paying the same $1.75 for a shorter commute to earn minimum wage or less. Care to take a guess which one do you think actually is more dependent and a more frequent user of Metro; the person living way out in the suburbs by choice and expecting taxpayers to pay for their cheap trip or the poor who rarely travels outside a 5 mile radius who faces the full brunt of fare hikes? My bet is on the table that this bikeshare idea is going to fail, terribly. The costs don’t make any sense. You already have people with low incomes who mainly do short trips refusing to ride Metro, hurting Metro’s ridership numbers because you raised the bus fare to $1.75. And you expect people with low incomes to pay $3.50 per 30 minutes for a bicycle that only gets around with a short distance, plus racking up $3.50 every 30 minutes even when the bike isn’t being used? A 30 minute bike ride to a restaurant + 1 hour eating at the restaurant + 30 minute bike ride back = $14. $14 for a trip within a short distance just to go something to eat at a restaurant? Multiply that by four for a family or a group of friends and it costs $56 total just to rent a bike? The cost to the user does not make sense. In comparison, Uber’s minimum fare is $4.65. If you’re traveling with 4 people and only need to go a shorter distance like a mile, Uber comes out to be cheaper ($1.16 per person for a mile trip, comes out cheaper than Metro), more comfortable, and faster (Uber comes to you, instead of you looking for a bicycle). And unlike the bicycle, you’re not charged when you’re not using Uber. This all comes back down to screwed up fare policies that Metro implements. Even at the best rate of $1.75 per 30 minutes, you’re not likely to get far on a bike. But the cost of $1.75 doesn’t add up when you consider for the same price, you can go all the way from North Hollywood down to Long Beach, a trip involving close to 38 miles (price per mile, 4.6 cents per mile) for that same $1.75 fare price. I agree that the walk-up fares are higher than I expected/hoped for the bike-share pilot, but your $14 restaurant trip calculation is incorrect. The point of bike-share is that there are stations located in areas with high demand (e.g. restaurants, housing, jobs, etc.). So you don’t bike to the restaurant, u-lock the bike-share bike outside the restaurant, eat your food, then bike back and return the bike. The total price of that trip would be $7, not the $14 you quoted. Imagine someone who meets a friend for lunch in Downtown twice a week (and is transit averse). They would spend about $75/month minimum on taking lyfts/ubers for these trips (minimum of $9.30 round-trip * 8). Or they could get a 30-day bike-share pass ($20). Metro stupidity strikes again. Why would anyone want to pay MORE than the bus fare just to get around SHORTER distances on a bicycle? Or spare yourself that money altogether and just use Facetime or Skype. I’m not paying seven bucks roundtrip for a short trip on bicycle or pay $20 a month on a bike share pass when for little over 2 years worth of bike share passes, I can buy a self-balancing powerboard on Amazon. I have better stuff to buy than hand over more of my money to government. Because they could probably get to the destination faster on bikeshare than they would on the bus? Especially if they have to transfer. Unfortunately, there is no fare integration between bikeshare and transit, other than charging to same fare, but I could see a lot of the low-frequency routes, even in the central city area (like the 71 or the 92) be thinned out as those people move to bikeshare. $3.50 for 30 minutes of use? I pay less than $3.00 in gas to fill up my scooter and that lasts me an entire week of travel. You guys can keep your government run bike rentals. I’ll stick with my 100 mpg scooter for my short distance needs. I was hoping for some sort of link between transit and bike share, since bike share is a great first mile/last mile solver. A Metro Day Pass should give the user 30 minutes of bike share free; ditto for a Metro monthly pass. I completely agree, and was disappointed that the fare structure was not designed in that manner. At the very least there should be a noticeable discount for those with a pass of some kind. A dollar per hour sounds like a more reasonable rate than $3.50 per 30 minutes. As stated above, it’s ridiculous to pay more for a transportation method that doesn’t get you very far, whereas a Pasadena to Culver City Metro rail ride across three different trains (Gold, Red/Purple, Expo) only costs $1.75. There really needs to be a massive fare reform soon. Metro fares are getting ridiculous and non-sensical. I have my doubts about this program. Riding around downtown is not easy. I commute through it by bike, am a seasoned commuter – and it’s just not easy. Bike lanes suddenly stop. Whopping pot holes and rough road due to all the construction. Rush hour traffic can clog cyclists way through intersections – then there are the motorists who are just oblivious. Where are the established bike lanes and routes that novice or even intermediate riders need to feel comfortable navigating through the traffic? Getting first timers out of their car is going to be a challenge. Those that are used to this kind of riding, well… we already have our own set of wheels.